Marie Hart spent most of her life in Broken Hill, NSW and she is one of five children of the late Pro Hart who is survived by Marie’s mother, Raylee Hart. Marie has jealously guarded against allowing her style to become an image or copy of Pro’s work but concedes to the fact that there is a “family style” that is familiar with all the siblings. In 1989-90, Marie travelled again on a working holiday to Singapore, England, Europe and America. Her pictures done in France, Italy and Amsterdam sold before she got them home but the colour studies she had done became a new direction for her painting on her return to Australia. ‘The Flower Seller’ is a good example of this change of direction. Marie was awestruck by an old man she met in London. She was with some friends and had just left a Pub when she noticed his stand filled with flowers. She asked for a Blue and Orange arrangement and then on paying for them noticed that he was blind. She asked how he knew the colours if he couldn’t see them. He told her it was the scent and feel. She asked if that worked for everything and he reached out and touched her face and hair then told her about her hair colour and completion. When Marie returned to Australia, she painted his portrait as he would see it, with no reference to structure, just shape through touch. From 1994 to 2004 in Broken Hill, Marie opened her own gallery ‘The Red Chair Atelier’ where she exhibited her own work as well as members of the Atelier. Marie began offering Art classes in Life Drawing, Working with Oils, Water colour for Beginners and creativity classes for kids, taught by her and other professional artists both local and visiting. Besides being a gallery, the Atelier was a studio space in which both professional and novice artists came together. All forms of painting, printmaking, sculpture, photography and filmmaking took place. It was a very creative atmosphere where there was no formal ‘teachers’, just other professional artists who would use the space and instead of paying for the area and equipment, would work with and mentor people of all ages and experience. 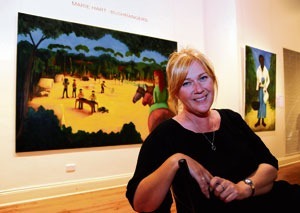 Marie has exhibited her work since 1983 in mixed exhibitions and various shows and was launched as an Artist in her own right after an ‘Australia Day’ exhibition at the Adelaide Casino in January of 1987 where she outsold Pro Hart on opening night. Since then her work has sold in galleries throughout Australia and she hangs in collections here and overseas, most recently Sofia, Bulgaria. Marie relocated to the coast of Adelaide, South Australia, in December 2004 with her two children, enjoying success with acceptance of her work not only in Australia but internationally as well. In 2016 Marie opened “Mischief and Mayhem” a Café, Wine Lounge and Art Space on the Broadway in Glenelg South. Mischief supports and promotes small batch wine makers and artists of South Australia.